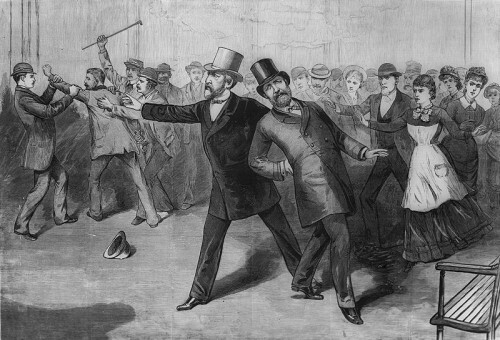 President James A. Garfield lay in a rodent-infested sickroom in the White House, a bullet lodged in his body. Weeks had passed since the assassin had struck, but more than a dozen doctors were struggling to save him. Day after day, summer temperatures approached 100 degrees, and mosquitoes thrived in the swamps around Washington. Four White House staff members had contracted malaria recently, as had the first lady, Lucretia Garfield. The president’s internal infections raged and spread, fevers came and went, and his heart began to weaken. He felt it most in his lower extremities—the acute neurological sensations he called “tiger’s claws,” which seized him regularly. Aides at his bedside would squeeze his feet and calves with all their might to relieve the 49-year-old president’s pain. His three oldest children, Harry, James and Mollie, all teenagers, were taken into his room for visits, advised to do most of the talking and not to bring up anything unpleasant out of fear of aggravating their father’s condition. Doctors desperately probed Garfield’s abdomen with unsterilized tools and unwashed hands in search of the bullet, which had lodged harmlessly in soft tissue near his vertebrae. Such a gunshot wound today would require no more than a few days in the hospital. But the 20th president of the United States was spiraling rapidly and inevitably to his death—bravely and for the most part in good cheer as his physicians made one mistake after another, from nutrition to medication. . . .